Crashing Season is a unique kind of runner game. 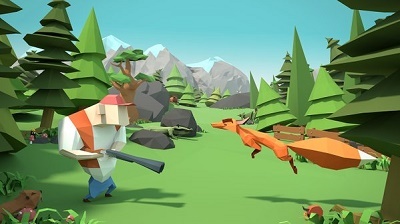 The levels are not infinite but the running is, so the level designers have had to take some unique approaches into keeping the gameplay interesting throughout the game. Other goals included keeping the levels simple enough to not affect the performance of the game on mobile device, while making sure the levels were exciting and still offering surprises to the player. There are some general challenges brought on by the gameplay style of Non-stop running on mobile when not using the traditional randomized map generation as is popular with infinite runners. 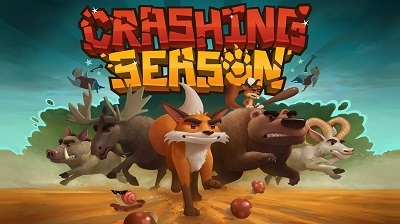 Crashing Season uses a hand crafted arena style layout so very large and sprawling maps would affect the performance too much. Such an arena style layout combined with the non-stop running also means that there cannot be any dead ends, the player’s mad forward dash should not be impeded too much. Furthermore, the arena style layout means the maps are not linear. The player can go to the different parts of the map in the order that they themselves choose. This means there needs to be something to encourage the player’s movement all around the map to avoid the player just spinning around a single spot of the map. This can be done through power-ups, spreading around the enemy spawns around the map, making interesting paths or environmental dangers etc. In the laboratory stage the exploration was encouraged through having enemies grow to monster versions of themselves after being exposed to radiation, after which the only way to destroy them is to lead them to the automated laser cannons located in each end of the arena. After the layout of the level seems to work, the map can be polished with details and extra content within the limits set by the performance of the devices. Final draft of the laboratory map. While our level designers in the have worked on the levels based on their own mental images of how the gameplay would proceed, we here at Koukoi have also used testing and analytics to polish certain parts of the level design to avoid players putting the game down due to repeated failures early on in the game. The very first levels of the game had a lake in the middle of the map surrounded by steep cliffs. Now, going off any cliffs is instant death in the game and many testing players happened to run straight into the lakes and die way too often for our liking. So we removed all the lakes from beginning levels. Another important level design change made in Crashing Season was borne through Unity Analytics showing us that level 4 in world 1 has a serious choke point due to many players not continuing past that point. Testers had shown us that the map had a death trap in the middle, between the two hands of the “clock” in the concept art picture shown below. We noticed the seriousness of the problem when Unity Analytics showed us that many testing players simply couldn’t get through the goal in the level which included the player having to go to the central island, even when they could have done so when the hands were not in the position to crush the player between them. The solution at that point was to remove the other hand altogether, thus making the goal much easier to complete, although we did end up revamping the goal system. For the data driven level designer, heat maps (in our case created through Unity Analytics) can be a valuable tool in determining the hotspots of your maps and whether some parts get no movement at all. If a part of a level gets little to no movement, maybe consider cutting it out or redesigning it. The arctic laboratory level, showing uniform movement through all areas. The red spot sees the heaviest movement as it is the spawn point of the player character. The gold mine level shows a heavy preference to a certain corridor. As our dev team worked on the code side of the levels, they wished time and time again that they could make larger size maps to be able to fit even more cool details or features to spice up gameplay. However, through testing it was realized that more compact maps are just better for the type of gameplay Crashing Season has. Compact (but not too small) size means the gameplay can stay more hectic if that is the feeling we wish the player to experience. Analytics such as churn rate can help you identify chokepoints in the game that need extra work. Test your levels thoroughly, make sure even lower end devices (ones that you intend the game to be run on) can run the levels without a performance drop. Big levels can be fun in many games but make sure your maps are detailed enough, leaving little details for the player to discover can make a level great. Having some dynamic elements (e.g. destroyable or movable objects) in your maps can also add excitement and give the player more sense of power. Crashing Season is out now for iOS and Android devices so I invite you to try out our level design yourself! We appreciate all feedback. This article was originally posted on Koukoi Games' blog on May 26th, 2016 at http://koukoi.com/2016/05/26/designing-levels-for-crashing/. 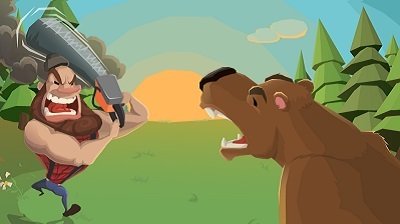 The article was co-written by Graphical artist Antti Katajamäki and Game Marketer Matti Luonua.